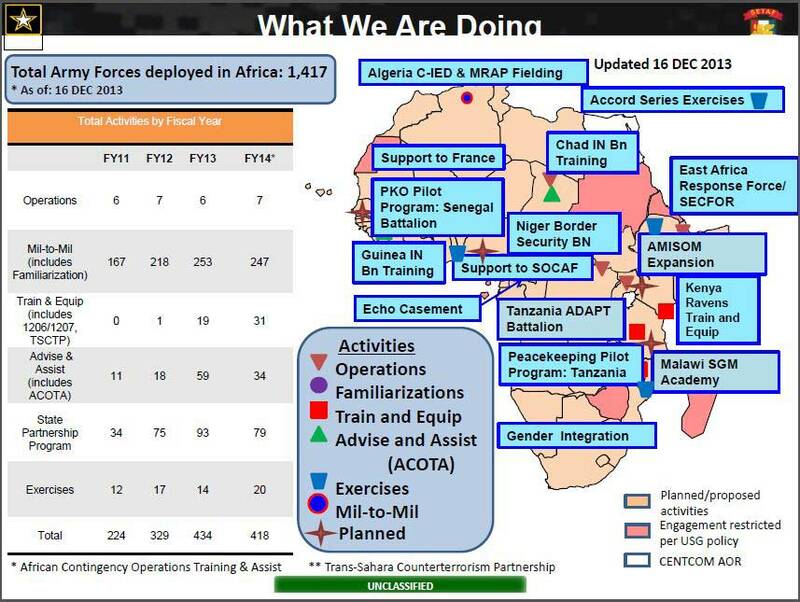 Nick Turse’s data and map (below) from AFRICOM and the DOD reminds us of the explosion of the militarization of US Africa policy – both in missions in Africa with (1) “a 94% increase in all activities by Army personnel from 2011 to 2013, including a (a) 174% surge in State Partnership missions (from 34 to 93) and (b) a 436% jump in Advise-and-Assist activities including ACOTA missions (from 11 to 59). Last year, according to a December 2013 document, these efforts involved everything from teaching Kenyan troops how to use Raven surveillance drones and helping Algerian forces field new mine-resistant ambush protected vehicles, or MRAPS, to training Chadian and Guinean infantrymen and aiding France’s ongoing interventions in West and Central Africa.” Turse’s data do not include the hundreds of US military and intelligence personnel in US embassies in Africa and in the Africa security agencies and Africa-focused policy and studies programs in the U.S in the DOD and its many contractors. In the meantime, the US is $200 million in arrears in funding its obligation to support the costs of the 15 current UN peacekeeping missions, including in DRCongo, South Sudan, Darfur, Ivory Coast, Liberia, Mali, and Western Sahara.